Posted on January 9, 2013 at 5:17 pm. 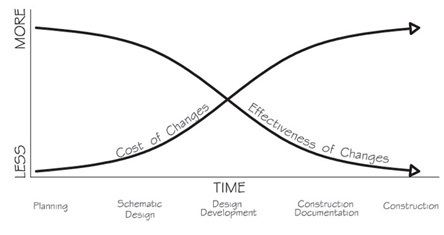 Almost all building projects go through a similar design process. In the beginning, it is easy and inexpensive to make significant design changes in order to arrive at the right solution. With each phase of design, more detail is added, so as the phases go on, it becomes more difficult and costly to make changes. Because most arts and cultural facilities are very complex projects for which the clients have specialized needs, it’s important to stay involved and aware throughout the design process.